In each section of AgencyBloc, you'll see tables with different columns representing data from records in your account. You can customize which fields are displayed to get more information at a glance in each section. Learn how to organize the data in your account to see what you need. To update column settings, users need Manage Data, and Manage Custom Fields permissions. Column settings control what data you see in the sections of AgencyBloc. 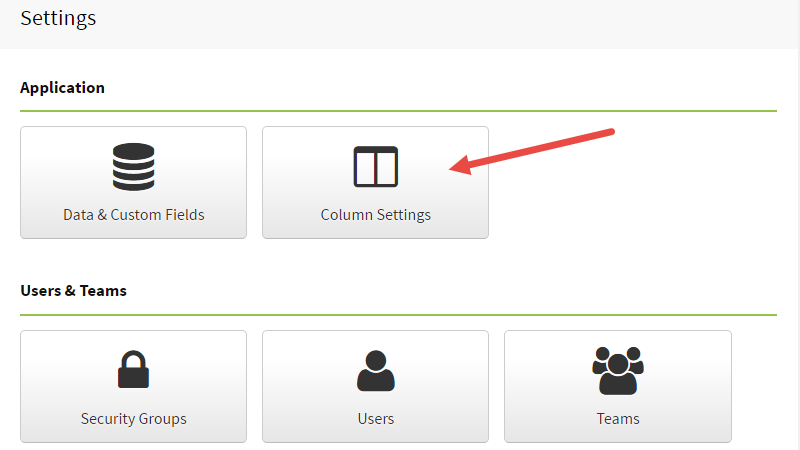 You can customize column settings so you can see information relevant to your agency. You can even display custom field information. There is no limit to the number columns you can add, though we recommend using around 7-11 data columns for the best viewing experience. From Profile & Settings icon, select Settings. Select Column Settings and then choose the area you want to update from the drop down. Add or remove columns and then set the order by dragging & dropping items. By default, each area includes several columns. You can always reset the columns back to their default by selecting Reset to Default. The next time you visit the area you updated, you'll see the change reflected. Repeat for any other areas you'd like to update. You can search and filter records to find what you need. A field does not have to be displayed in order for you to search for it. Additionally, not all data displayed is searchable. Check out the article on Searching All records and Quick Search for what is searchable. Also, you can sort the columns by clicking on the column heading. This quickly sorts the data by the column selected.